As I've done for the past couple of years, I’ve been trying to think about celebrating successes from the year instead of revisiting what I didn’t accomplish and resolving to do better (for more on this approach see Julie Hedlund’s recent blog post). Her suggestion is to use your successes and achievements as a foundation for setting new year goals. 2. I read over 300 new fiction picture books and board books as a first round panelist for the Cybils Awards. It was so much fun discussing these books with my fellow panelists! 3. I worked hard on revising a middle grade novel and am close to finishing my revisions. 4. I revised several picture book manuscripts and my agent sent some of them on submission. 5. I participated in an adult fiction book club at my local library. No matter how they are, taking time to celebrate successes lifts you up. I urge you to give it a try and dive into 2018 on a positive note! What are you most proud of this year? I hope you feel good about your successes! 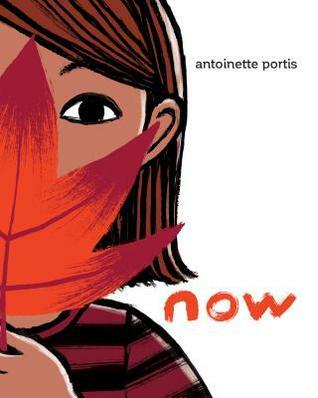 A deceptively simple book that reminds us about how young children experience the world. Follow a little girl as she takes you on a tour through all of her favorite things, from the holes she digs to the hugs she gives. Now was written and illustrated by Antoinette Portis, and published in 2017 by Roaring Brook Press. This is my favorite breeze. This is my favorite leaf. because it’s the one I am digging. The text is a nice demonstration of how repetition of the structure can help to move the reader through the story. The text itself is short and feels very immediate, which goes well with the point of the story. While I think this is an excellent story for parents and young children to read together, it also would work in a preschool or kindergarten class for talking about “favorites.” It could spark an investigation into “favorite things.” I love how it reminds us of the young child’s perspective. Discuss: What is your favorite right now? Draw a picture or explain why. NOTE: This title has been nominated for the Cybils Award, and I am a first round panelist. There are many nominations and six other judges. My opinions should not be construed as a sign of inclusion or exclusion on the final short list. This book shows the world from a different point of view – a bird’s eye view! 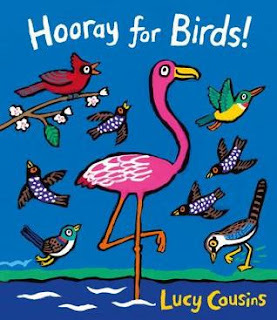 Hooray for Birds was written and illustrated by Lucy Cousins. It was published in 2017 by Candlewick Press. I really enjoyed the fun rhyming text and big, bright illustrations. It’s a good example of rhyme done well and it encourages children to engage with the story. My students would enjoy this book, because of the catchy rhyme and big colourful illustrations. The bird actions are fun and this would be a great book for encouraging dramatic play. It would also be nice to include with non-fiction books about birds at a science area. Read through the story and act it out as you go along! Create your own drawing or painting of a bird in the style of Lucy Cousin’s art with a dark outline. Cut out each bird and display them together. Photograph each student performing a bird action, perhaps with handmade bird accessory or prop, and make a class book.